금강반야바라밀경은 줄여서 ‘금강경’이라고 부르기도 하는데, 우리나라에서는 조계종의 근본경전으로 반야심경 다음으로 널리 읽히고 있는 경전이다. 금강반야경소론찬요조현록(金剛般若經疏論纂要助顯錄)은 당나라의 종밀(宗密)이 지은『금강반야경소론찬요』를 송나라의 혜정(慧定)이 알기 쉽게 설명한 것인데, 상·하 2권이 하나의 책으로 되어있다. 나무에 새겨서 닥종이에 찍었으며, 크기는 세로 28.4㎝, 가로 16.5㎝이다. 표지는 검푸른 색이며, 왼쪽 상단에 금색으로 그린 2줄의 사각형 안에 제목이 쓰여 있다. 책 끝에 있는 고려말의 고승 환암(幻菴)이 쓴 기록을 통해, 이 책은 1339년에 원나라에서 간행한 책을 원본으로 하여, 고려 우왕 4년(1378)에 충주 청룡사에서 다시 새겨 찍어낸 것임을 알 수 있다. 『금강반야경소론찬요』는 비교적 잘 알려져 있으나 그것을 다시 풀이한 이 책은 희귀본으로 중요한 자료로 평가된다. Geumgangbanyagyeong involves the contents that the complete severance of all the pain chains leads to the world of enlightenment by the diamond-like wisdom. This is the secondly read Buddhist sutra, following the Banyasimgyeong, among the Banyabul family of sutras whose fundamental is the thought of vanity. 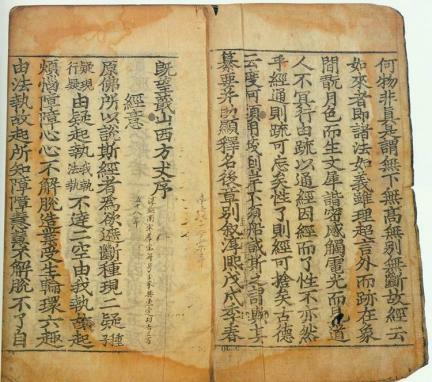 This book had the Geumgang banyagyeong soronchanyo, which was written by Jongmil (in Sung, one of Chinese Dynasties), easily interpreted by Hyejeong in China (Sung), consisting of one book with the first and last volumes. 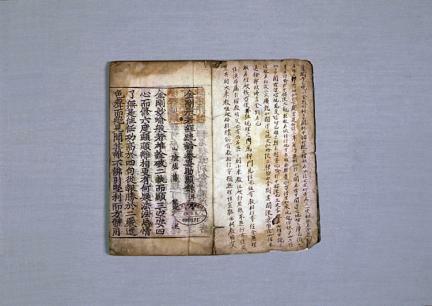 It was printed on mulberry paper after engraving wood and the size is 28.4cm by 16.5cm. The cover is dark-blue and the title is written inside the golden double quadrangle to the left upper. 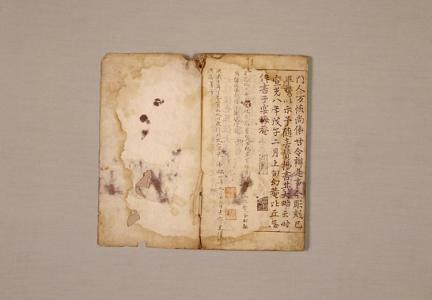 Depending upon the record written at the end of book by Monk Hwanam in the end of Goryeo, it demonstrates that this book was engraved again and printed at the Yeonhoeam Hermitage of Cheongnyongsa Temple in Chungju in 1378, 4th ruling year of King Uh in Goryeo. Geumgang banyagyeong soronchanyo is comparatively well known, but this book that interpreted it is a rare edition. So it is evaluated important sources.